I don’t always agree with Tucker Carlson, especially when it comes to Russia, but there is no denying he is an excellent and fair journalist of the first order and now he’s being threatened by Antifa. Fox News was lucky to get him. It appears he’s ruffled the mangy fur of communist Antifa. I guess when they aren’t threatening my friend and colleague Trevor Loudon they are going after anyone else who disagrees with them. For the life of me, I don’t understand why Tucker doesn’t have tighter security. He’s been targeted before and he doesn’t deserve this, but he better take these violent radicals at their word and arm up for his family’s sake. A video was posted to social media by Smash Racism, D.C. (shown further down). These are the very same asshats who confronted Senator Ted Cruz (R-TX) and his lovely wife Heidi at a restaurant in DC during Brett Kavanaugh’s Supreme Court confirmation hearings. Antifa threatened Cruz and his family. They have terrorized a number of other conservatives as well. Antifa posted on Facebook (where they still operate freely while conservatives such as NoisyRoom.net and Right Wing News are banned) that Carlson spreads “fear into our homes,” and said it wanted to even the score. “Each night you remind us that we are not safe. Tonight, we remind you that you are not safe either,” the group posted. They also chanted, “Racist s—bag, leave town.” The post was taken down later. 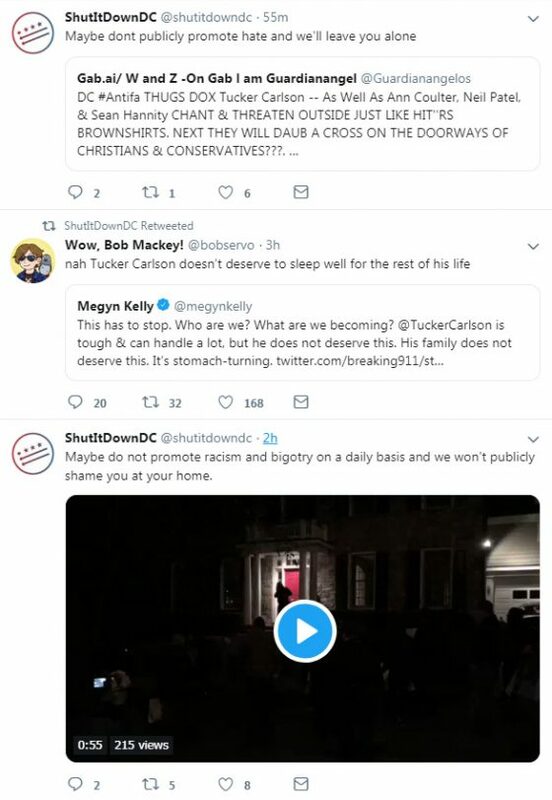 Carlson, the host of “Tucker Carlson Tonight” on Fox, was not home at the time. Tucker said his wife, Susie, was home alone and heard the communist mob from the kitchen. She called the police and locked herself in a pantry, he said. She must have been scared to death over this. His brother, who lives nearby, arrived about the same time as law enforcement. Tucker stated that the thugs rang his doorbell, broke his oak door and then one protester was apparently caught on security video mentioning a pipe bomb. 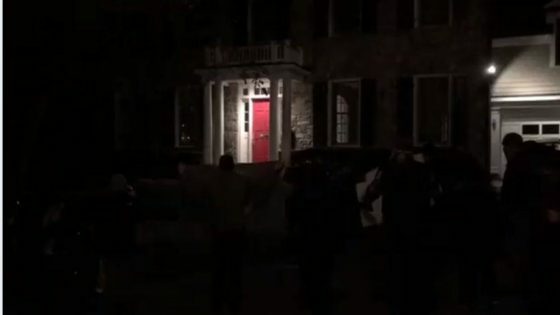 At least one of the protesters went all the way up to Carlson’s front door, where they left a sign with his family’s home address written on it to ring his doorbell. The police are not saying much at this point. Carlson was in his office at Fox News in DC working on his opening monologue when neighbors texted him about the events outside his home. His wife of 22-years did not contact him because she didn’t want to distract him before he went on air, he said. That’s noble and loving, but she should have. They could have killed her. The Antifa mob eventually broke up. It’s not known if there were any arrests made. Antifa went on to dox Carlson, his brother Buckley Carlson, Ann Coulter, Sean Hannity and his former college roommate, Neil Patel, who co-founded The Daily Caller with Carlson. Tucker stated that he is used to being confronted in public and has no interest in playing the role of victim, but he said his wife and his four children should not have to be exposed to this aggression while at home. No, they shouldn’t. 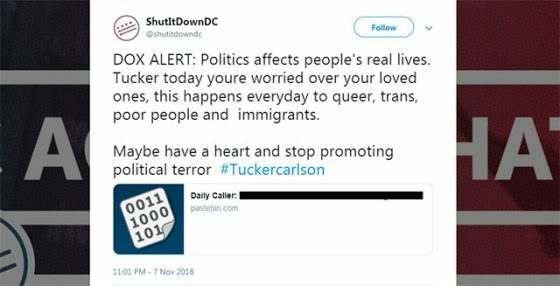 Tucker is a tough guy but his family is being seriously threatened here. “Here’s the problem, I have four children,” he said by phone. “I never thought twice about leaving them home alone, but this is the reaction because this group doesn’t like my TV show.” And I hate to break it to Tucker, but it will only get worse from here on out the way things are going. Communists don’t play well with others and violence is second nature to them. 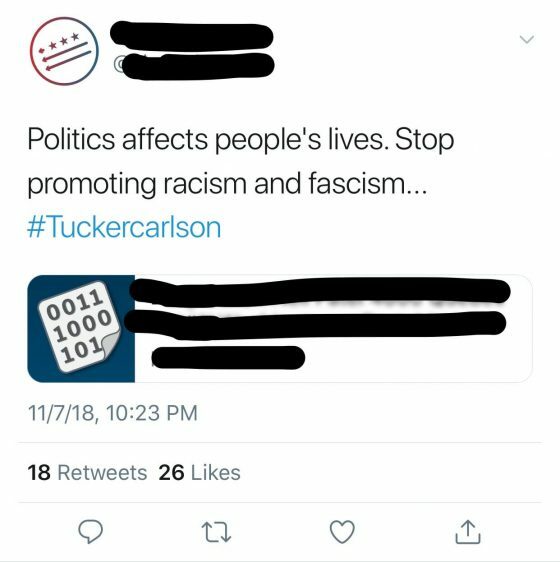 Twitter reportedly removed a photo of Carlson’s home address that was posted by the group. Smash Racism DC’s Twitter account was suspended early Thursday. But Facebook? Well, they are cool with it. Just not with conservatives who back up their writing and research with sourced facts. Brit Hume, a Fox News commentator, took to Twitter to denounce the protest as “revolting, and frightening.” It’s all that and much, much more. Gateway Pundit is reporting that according to a source, Tucker Carlson has been harassed so much that he cannot go out to eat or safely use the front entrance at Fox News. For those who foolishly believe that with a split Congress the violence and mobs will die down, they are in for a big disappointment. Just the opposite is true. These violent communist Antifa thugs are going to keep doing this until it totally blows up. These are the soldiers of the left and the Democrats and they are just getting warmed up.